who conquered K-2 on July 28, 2017, brought the Pakistani flag that was raised on K-2 summit to the Pakistan High Commission, London on Tuesday. peak, which is the second tallest in the world. Vanessa became the first British woman to conquer K-2, 24 years after Jonathan Pratt became the first British male to do the same in 1993.
determination to accomplish the feat. was impressed by the people of Pakistan, especially talented youth, their generous hospitality, the pristine beauty of the mountains and landscape of northern areas, and the economic potential of the country. Welcoming the mountaineer, the High Commissioner felicitated Vanessa on her singular achievement of becoming the first British woman to summit the K-2. He commended her indefatigable determination and courage to accomplish this difficult adventure. 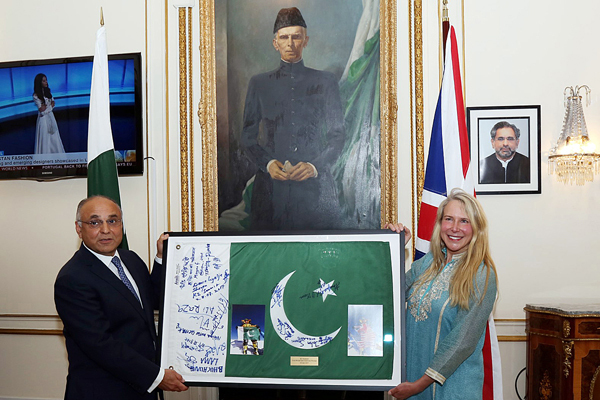 The High Commissioner thanked Vanessa for telling the positive story about Pakistan and its people, and termed her a goodwill ambassador of Pakistan. He also hoped that Vanessa’s achievement and amazing story would attract many more mountaineers and adventure tourists to Pakistan in future. The reception was attended by the cross-section of the British and the Pakistani society as well as representatives of media.